In "Slashdot Struggles to Remain Relevant in the Social Web", ReadWriteWeb asks "Why is Slashdot almost irrelevant to the social media community?" "Just because something is online, does it necessarily mean that attention from the 'social media community' always the best—or even a good—measure of success?" They're comparing apples and snow-tires. Seriously... What exactly does Slashdot have in common with the likes of, say, Digg? On Slashdot, people submit stories that admins select for publication. With Digg, Delicious and so on, the process is a bit more democratic, operating more like a common service first and a news-source second. 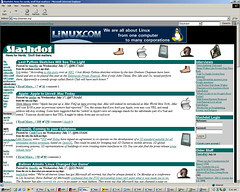 Slashdot never aimed to be a service, as such. This miscategorization allows RWW to make the statement that "Slashdot is no longer the powerhouse that it once was." This may be true, but the argument that RWW is framing looks like it was built for no other reason than to needle an iconic Web destination. Further, Slashdot has a topic focus and a specific, narrower audience. On the other hand, the focus of the news-memeing sites is pretty much whatever the online zeitgeist wants it to be and, therefore, has a broader appeal. To wit: When I noticed this RWW post, one of the day's most popular items on Slashdot had the headline "Dell and HP to Sell Oracle Operating Systems." By contrast, the most-Digged item in the past 24 hours was a parody of the PETA ad featuring Sheryln Chopra in her lingerie. Okay... I'm talking to the guys here... Given the choice, which of the two would you recommend to your friends? Is this a reflection on Slashdot? Hardly. It's more a reflection of how the Web in general, and social tools specifically, have been democratized and, therefore, are made to reflect a broader range of interest. Then there's "death by Excel." I guess I'm supposed to gasp at oh-how-the-mighty-have-fallen when RWW shows me a sloping-down-and-to-the-right graph detailing Slashdot's traffic since March 2007. Context is everything, though. A decade or so ago, Slashdot used to be one of the few places to go for community-based tech news. People who were perhaps more casually interested in tech slogged through stories about Linux kernel upgrades and MySQL patches to get to tidbits about CES or iPods. Today, of course, there's plenty more choice. Sure, Slashdot's traffic has suffered but I argue that it probably has a much more qualified audience. Was Slashdot slower to introduce Facebook and Twitter integration? Perhaps. Has it "historically favored stories submitted from traditional media, over 'new media'" with the perceived result of making the site "seem behind the times and a bit too closed minded?" Newsflash: The "traditional media" observably still drives a gigantic chunk of the conversation from pretty much all of the Social Web. Call me a fuddy-duddy, but I actually do read Slashdot, though more out of a personal interest (I'm an open-source software enthusiast) than a professional one. Occasionally, though, the site provides me with information that serves the intersection between the two. Once again, the social media digerati are so focused on leaderboards and horseraces that it forgets the real value that social media brings—the ability to serve niche and broad audiences economically. From my perspective, Slashdot does the former admirably well and in ways that RWW's analysis certainly gives lip service to, yet ultimately does not reflect.